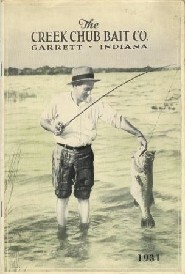 From out of the small town of Garrett, Indiana rose one of the largest antique fishing lure companies of our time. The Creek Chub Bait company was born of Henry Dills, George Schluthesis and Carl Heinzerling. Though Henry Dills is given much of the credit for the true beginnings I feel it would not have been the same if not for the three men mentioned above. Friendship, fishing and their desire to succeed would put into motion one of the largest volume producers of wooden glass eyed, now antique lures of the 20th century. Each played an intricate role in the firms success, Carl, owning the local hardware and sporting goods store as well as being a financier, Henry thought to be the originator of the idea of the wiggler, and George the master businessman. Most people think Pikie is synonymous with the word Creek Chub. How true that may be, but the roots and official bait that started the company is the wiggler. 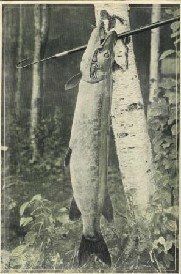 The first patent or invention impacting the industry outside the lures themselves was for the patent of the artificial appendage or lip to attach to the lure, to make it wiggle. Patent # 1,352,054, or as most would know it by seeing it on the lip of a bait, 9-7-20 and 9-27-20 . The fishing tackle and lure industry and old fishing lure hobby would not be the same if it were not for Creek Chub and this idea which dramatically changes the dynamics of the industry. The scale wars as we collectors call it were based on Creek Chubs patent number 1,323,458 in which was granted 1921 to spay paint trough a netting thus yielding a scale type finish on the lures. Although granted so late, they had been doing this since the mid teens as well as the other competitors copying their idea. Creek Chub not having the resources at the time, concedes to accept other benefits from its competitors and grants Heddon access to half the patent. No doubt the most prolific bait, is the Pikie. This throughout the 20th century was produced in more quantities than any other bait I do believe, although I cannot prove that. Its myriad of styles, hardware's, colors, and sizes leads to some great collectors displays. As time progresses I will add to the pages, adding more history, to the evolution of some of their now antique lures, from the wiggler, to the Pikie minnows and on to the Injured Minnows. There will be pages on this website to help distinguish colors painted on the antique lures, boxes and the series numbers used to identify their baits. All in effort to provide a enjoyable education website devoted to the Old Fishing Lure.